Dr. Kaprio has worked in epidemiology, in particular genetic epidemiology. His central interests have been in the study of adult chronic disease and the development of their behavioral risk factors with a focus on addictions and metabolic conditions. In particular genetic and environmental factors affecting smoking, alcohol use, physical inactivity, sleep and obesity have been studied using twin, family and molecular genetic approaches. He has worked with the Finnish Cohort studies since 1976, and has been responsible for a steady expansion of the included cohorts and very extensive phenotyping through repeated questionnaire and interview surveys, biosample collections and record-linkage to national medical registries. He is an internationally recognized expert in epidemiology and twin studies with over 700 original scientific publications. 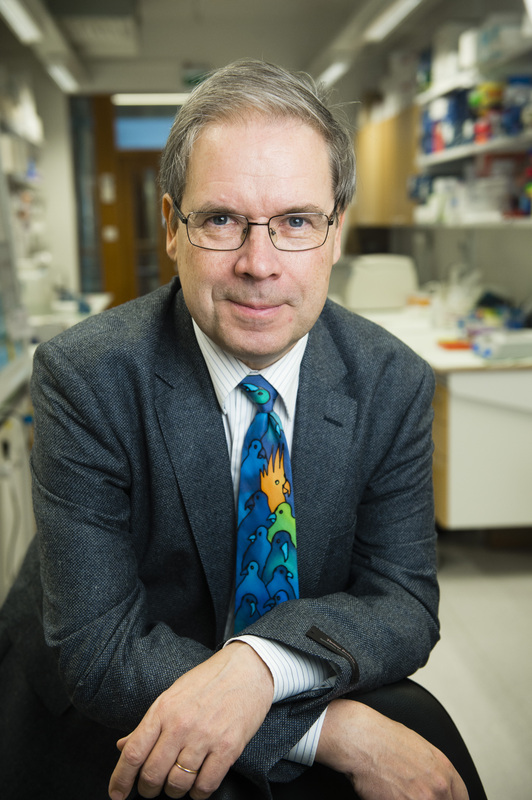 He has had continuous NIH funding for the past 25 years and was Director of the Academy of Finland Centre of Excellence in Complex Disease Genetics (2007-2011). He has received several international science awards and he has been President of the International Society for Twin Studies. He is President of the Society for Research on Nicotine and Tobacco European chapter in 2011-2012. He has supervised 45 PhD students and received the Maud Kuistila award for excellence in doctoral training. He held an Academy of Finland professorship for 2013-2017. Jaakko Kaprio, M.D., Ph.D. is Professor of Genetic Epidemiology at the University of Helsinki, Finland and Research Professor in Behavioral Genetics at the National Institute for Health and Welfare, Helsinki. He graduated from medical school (University of Helsinki) in 1976, and defended his PhD in Epidemiology in 1984. He has trained abroad at the University of Southern California, Indiana University and University of Michigan in 1987-1989. Bevilacqua, L., Doly, S., Kaprio, J., Yuan, Q., Tikkanen, R., Paunio, T., Zhou, Z., Wedenoja, J., Maroteaux, L., Diaz, S., Belmer, A., Hodgkinson, C. A., Dell'Osso, L., Suvisaari, J., Coccaro, E., Rose, R. J., Peltonen, L., Virkkunen, M. & Goldman, D., 2010, In : Nature. 468, 7327 , p. 1061-U460 8 p.
Furberg, H., Kim, Y., Dackor, J., Boerwinkle, E., Franceschini, N., Ardissino, D., Bernardinelli, L., Mannucci, P. M., Mauri, F., Merlini, P. A., Absher, D., Assimes, T. L., Fortmann, S. P., Iribarren, C., Knowles, J. W., Quertermous, T., Ferrucci, L., Tanaka, T., Bis, J. C., Furberg, C. D. & 96 othersHaritunians, T., McKnight, B., Psaty, B. M., Taylor, K. D., Thacker, E. L., Almgren, P., Groop, L., Ladenvall, C., Boehnke, M., Jackson, A. U., Mohlke, K. L., Stringham, H. M., Tuomilehto, J., Benjamin, E. J., Hwang, S-J., Levy, D., Preis, S. R., Vasan, R. S., Duan, J., Gejman, P. V., Levinson, D. F., Sanders, A. R., Shi, J., Lips, E. H., Mckay, J. D., Agudo, A., Barzan, L., Bencko, V., Benhamou, S., Castellsague, X., Canova, C., Conway, D. I., Fabianova, E., Foretova, L., Janout, V., Healy, C. M., Holcatova, I., Kjaerheim, K., Lagiou, P., Lissowska, J., Lowry, R., Macfarlane, T. V., Mates, D., Richiardi, L., Rudnai, P., Szeszenia-Dabrowska, N., Zaridze, D., Znaor, A., Lathrop, M., Brennan, P., Bandinelli, S., Frayling, T. M., Guralnik, J. M., Milaneschi, Y., Perry, J. R. B., Altshuler, D., Elosua, R., Kathiresan, S., Lucas, G., Melander, O., O'Donnell, C. J., Salomaa, V., Schwartz, S. M., Voight, B. F., Penninx, B. W., Smit, J. H., Vogelzangs, N., Boomsma, D. I., de Geus, E. J. C., Vink, J. M., Willemsen, G., Chanock, S. J., Gu, F., Hankinson, S. E., Hunter, D. J., Hofman, A., Tiemeier, H., Uitterlinden, A. G., van Duijn, C. M., Walter, S., Chasman, D. I., Everett, B. M., Pare, G., Ridker, P. M., Li, M. D., Maes, H. H., Audrain-McGovern, J., Posthuma, D., Thornton, L. M., Lerman, C., Kaprio, J., Rose, J. E., Ioannidis, J. P. A., Kraft, P., Lin, D-Y. & Sullivan, P. F., 2010, In : Nature Genetics. 42, p. 441-447 8 p.
Thorgeirsson, T. E., Gudbjartsson, D. F., Surakka, I. L., Vink, J. M., Amin, N., Geller, F., Sulem, P., Rafnar, T., Esko, T., Walter, S., Gieger, C., Rawal, R., Mangino, M., Prokopenko, I., Maegi, R., Keskitalo, K., Gudjonsdottir, I. H., Gretarsdottir, S., Stefansson, H., Thompson, J. R. & 31 othersAulchenko, Y. S., Nelis, M., Aben, K. K., den Heijer, M., Dirksen, A., Ashraf, H., Soranzo, N., Valdes, A. M., Steves, C., Uitterlinden, A. G., Hofman, A., Toenjes, A., Kovacs, P., Hottenga, J. J., Willemsen, G., Vogelzangs, N., Doering, A., Dahmen, N., Nitz, B., Pergadia, M. L., Saez, B., De Diego, V., Lezcano, V., Garcia-Prats, M. D., Ripatti, S. O., Perola, M., Kettunen, J., Shen, H-Y., Kaprio, J., Palotie, L. & ENGAGE Consortium, 2010, In : Nature Genetics. 42, p. 448-453 6 p.
Nakaya, N., Bidstrup, P. E., Saito-Nakaya, K., Frederiksen, K., Koskenvuo, M., Pukkala, E., Kaprio, J., Floderus, B., Uchitomi, Y. & Johansen, C., 2010, In : American Journal of Epidemiology. 172, 4, p. 377-385 9 p.
Hublin, C., Partinen, M., Koskenvuo, M. & Kaprio, J., 2011, In : Sleep. 34, 7, p. 957-964 8 p.
Korhonen, T., Piirtola, M. & Kaprio, J.
Graner, M., Pietiläinen, K., Kaprio, J. & Rissanen, A.
Wedenoja, J., Kaprio, J., Loukola, A., Korhonen, T., Hällfors, J., Heikkilä, K., Ripatti, S. & Tikkanen, E.